At 6.30pm I was taking the shortest route out of Bolton, making my way to Didsbury, where I was to meet Tom. Together we were to ride through the night to that little Warwickshire village tucked away in the heart of England, the village that is like a magic wand to cyclists……Meriden. My heart was light, my saddlebag heavy, as I waited at Kingsway end, watching the motley collection of traffic homeward bound. I had not to wait long, and soon we were forcing our way through crowded Cheadle, and along Wilmslow road. 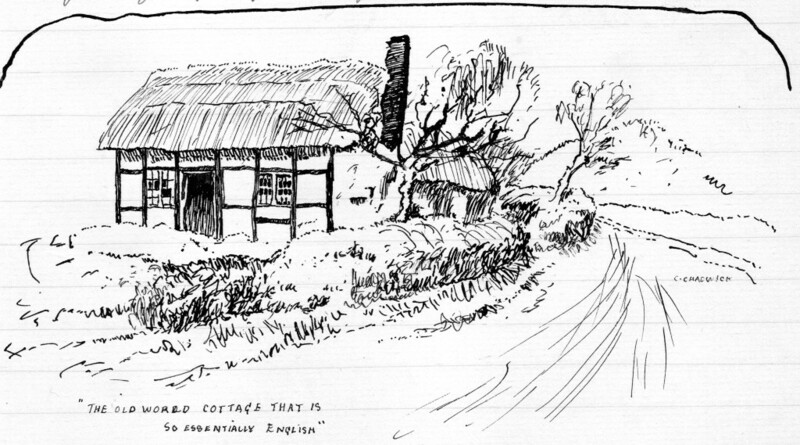 The latter place was duly reached, we soon came to Alderley Edge, and a mile further on, we were halting at that old-world farmstead, in a quiet backwater at Alderley Cross. Here, Mrs Powell made us welcome as we trooped in out of the cool room for supper, 8.30. The latticed window was thrown open, revealing the lane in front, with the hedges and fields beyond, garbed in the fresh green of spring. Here we lingered, watching the golden-red russet fade, giving way to an infinite twilight. Whilst it was yet light, we left Alderley Cross, and soon reached the now silent highway. This road, though always pretty, usually wearies us, owing to familiarity, but tonight we knew no such thing. Beside us, the Western sky was radiant, before us a mellow moon had risen, which, on the tree-shaded road made yellow, leafy patterns. Lighting up time came and went, leaving us still unlit – it did not seem worthwhile, in the now bright moonlight. Now, the silvery waters of Redes Mere, Marton, with its little old ‘black and white’ church silhouetted on a slight elevation from the road, an ancient cottage, nestling deep beneath the shadow of some sturdy old oak. These are real ‘living pictures’. Now we were nearing Congleton, signs of life betrayed the fact, and we lit our lamps. The Macclesfield road joined us, and we started dropping. We knew this hill of old, and our brakes were jammed on. Then we came in sight of the celebrated ‘road lighthouse’, the first of its kind. It is a tower, lit on a lower panel, and containing the words: ‘Very dangerous Hill – Change to low gear’ in deep red. Higher up are brilliant searchlights to show the nature of the road. Erected on a narrow bend, it is certainly striking and effective. Going carefully, we dropped down over the river Dane, and into Congleton. We soon left it, however, preferring the more silent road. Astbury faded into oblivion, then the trees and hedges again, and now we had the company of the hoarse corncrake, unseen, but very much heard! A short drop brought us to Red Bull, where the scenery ended with the advent of the Potteries. Now came a long climb through Talke, a squalid colliery village, with the gaunt hill before us showing black against the moonlit sky. Here in contrast to green fields behind, what there is left of nature are the poor, stunted ruins of once fine trees. Slag heaps, decrepit dwellings, the shadowy outline of some ugly pithead, denotes the ruthless march of ‘modern civilisation’. The road rose and fell continuously, each climb showing the same squalid outlook, each drop the same industrial confusion. Last year, when we last came through this district there was one redeeming feature: that was the effect of the furnaces. One moment a brilliant red glow would light everything in the vicinity, next, some chimney would seem would seem to be belching a ruddy smoke with wonderful effect. But now the bright moonlight made this impossible. At last we bumped and crashed our way over the terrible setts into Newcastle (11.50pm), and soon the Potteries were behind us. Thank God this has not been commercialised! We slid into the Trent valley, and as if by magic, the unkempt ugliness of the towns gave way to real, untainted England. Again, the smiling moonlit waters, the glorious woodlands, those old-fashioned homesteads, such scenes as made the American exclaim “So this is England!” Trent Vale, Trentham, then we were in a kind of park, the road was hedge-less, and time after time we ran over little bridges, beneath which some little brook babbled its way to its big sister, now within sight. At one point, a mist was creeping over the low-lying land, forming a kind of lake, into which the road disappeared. The larger trees and higher land appeared fantastically, ethereally, above in a filmy haze. Several times we crossed and recrossed the Trent, and later, as if wishing to be in the running, the railway joined us. Traversing the narrow, winding streets of Stone, we again entered the valley through Sandon to Weston, a superb picture of neat, black and white work in a gloriously wooded setting. A little later, a large notice board bade us ‘drive slowly for two miles through villages’. Two miles of villages! and truly rural at that! ; had it been in Lancashire, those two miles of villages, would soon be a large town, but here, each has a separate existence, to our eyes, each seemed to be competing with the others to see which could be the most beautiful. And each, from our point of view, were equally successful. A form outside a cottage on the deserted road tempted us, and being in need of refreshment, we turned it into a table and seat combined. We had quite grown out of lunch in the open, and to us it seemed great fun, and many jokes were cracked over our alfresco lunch. The moon still shone brilliantly, and clouds of the haddock – no mackerel – (well its something fishy, anyway) type constantly crossed it, and the night was unusually warm. After filling ourselves, we got on the road again, soon coming to Rugeley, an old market town. On the farther outskirts of the town, we stood debating, on which way of two to take, one signed ‘to Lichfield, flat road’, the other ‘to Lichfield, hilly road’. We decided on the hilly one, for we should be coming back on the lower one. The distance was eight and a half miles, or eight miles respectively. The hills started immediately, but the scenery! Those great trees that over-arched the road that, in places, was like a sunken lane lined with brambles, forget-me-knots, and other wild flowers, all fast asleep, but none the less pretty. Brereton, then Longdon, quiet, old world villages, then one and a half miles from Lichfield we joined the flat road, and rushed downhill to the famous city. The moon had disappeared now, and the half-light of early dawn made everything appear illusive, mystical. We trod the silent streets to the ancient cathedral, a gem of early architecture. In the semi-darkness we could see some of the numerous gargoyles and images, and the plumes that cover its massive frontage. High above us soared the three immense spires, one of which was scaffolded near the top. No doubt there is always something under repair about this wonderful structure. Going round to the west side, we noted a beautiful arched doorway of the Decorated period (13th century). It is a pity that we only got a vague idea of the place. As we left the city, the cathedral bells chimed 2.45am, in a beautiful tone. In the open country again, we turned our lamps out. Now the road climbed gently – gently but continuously. Again everything was like a garden, a broad, free garden, and very soon we entered the most English county, Warwickshire. It is of little use describing that road, or what lay in sight of it, for words fail to express the wonderful colour and sublimity of all things, for now dawn was breaking – well, we did not really know whether it was or not, for daylight came dully and slowly, a good sign for the new day. Bird life was fully awake, for the world resounded with their musical exuberant twittering. I think we caught some of their infectious spirit, for we brightened up wonderfully. Not that we were sleepy, or jaded, far from it, but we were just a trifle lonely. The fascination of travelling along a silent road, through silent woods, dead towns, and villages that were long asleep, wears off as dawn approaches, and the company of these feathered creatures put new life into us, and made us realise once again, the great, eloquent joys of the Open Road. At Basset’s Pole, on the Tamworth – Sutton Coldfield cross-roads, we started dropping downhill, through Wishaw, until we approached Coleshill. This town climbs a steep hill to the church, which is perched on the summit. In Coleshill, people were about, but after leaving the town, we were alone again. This section of the road to Stonebridge reminds me strangely of some Delamere Forest roads up in Cheshire, but, of course, things are on a bigger scale here, and are ‘forrarder’ than our way. Eventually, we reached pretty Stonebridge (which is just as its name implies), and then a short run brought us to Meriden at 5.45am. |After trying to awaken the folks at the ‘Laurels’, we gave it up and went across to Mrs Woodward’s at Ivy Cottage, where we got a wash and soon breakfast was ready. It is not necessary to enlarge on the massive meal that we tucked into. During breakfast, we watched a race, a ‘25’ was in progress. Then Tom Hughes, the Wigan veteran came downstairs, and we had a good chat with this hardy old-timer. A walk down the road revealed another pleasant surprise. Coming from the ‘Laurels’, playing football on the hard road, were half a dozen of the Bolton section, one or two of whom looked a trifle weary. We had a few moments with them before they went in to breakfast, then we had a walk along a pleasant lane, where we heard no less than seven cuckoos, and saw one. Another was already beginning to stutter! So the time passed. We spoke to lads from Birmingham and Coventry, Lancastrians like ourselves from Liverpool, Manchester and Warrington. We greeted, and were greeted by cyclists from London, Portsmouth, Southampton, Cardiff, Leicester, Derby and Notts, Sheffield and a hundred other places. We saw cyclists whose names are household words amongst cyclists, we – well, one must go to Meriden, to realise what Meriden is to cyclists of all classes. Perhaps the most noticeable fact was the predominance of the lightweight cycle. It was everywhere – as it deserves to be. [It should be noted that at this stage in Charlie’s life, his funds did not yet run to a lightweight – another year was yet to pass before his old 28 inch wheeled roadster could be consigned to history- Ed]. Again we were joined by the Boltonians, whose numbers were swelled with those who had travelled the day before, and those who had come at the last minute. We each received a hymn paper, and at 10am the service started. It was conducted in a simple, effective manner by the Rev. H W Layng, rector of Withyham, Sussex, who, after the first hymn, gave a short address. Then the Lords Prayer, another hymn, the ‘Last Post’, one minutes silence (during which one could have heard a pin drop), the ‘Reveille’, and the National Anthem. A Benediction was then pronounced, and he wound up by thanking those who had come long distances, and added that many had travelled through the night to attend. When the service was over, we made a rush for the bikes, for there was little time to waste. The main road was entirely stopped up with bicycles of all descriptions and makes. About six policemen tried to control a hopeless dozen yards of road. We could not find the Boltonians, so we immediately got on the road, Tom and I. We took a wrong turning at Stonebridge, but luckily it was soon rectified, and once more we made for Coleshill. The road was now all but deserted, and we made good use of the fact, for Coleshill was in sight almost before we knew it. Now we were settling down to it. Mile after mile was reeled off, those long steady gradients fell away behind us, we took the ups like heroes, made full use of the down, and fairly hummed along the level stretches. Bassets Pole was passed at evens, almost mechanically Lichfield swung into view, and without pausing we slashed through the city and up the hill beyond. We took the flat road now – really the Uttoxeter road, and bounded along towards Rugeley. We had not had a bite since 7am, so you can guess we were feeling a trifle ‘peckish’, but that did not interfere with our pace, though we had doubts about keeping it up all day. At Armitage, in Staffs, one mile from Rugeley, we spotted a ‘Teas’ board, outside a little cottage, and in a moment had dropped off the bikes, ordered lunch, and were having a cooling wash. It was now 12.30. Meriden was 30 miles away. 30 miles in one and three quarters of an hour – 17 miles an hour! We had just started lunch when a crowd of cyclists descended upon us. They were the Bolton section! – this was a stroke of luck. They had noticed the sign on their outward journey, and had decided to call on the return. There was about 14 of them, including two ladies and two Hindley chaps. During lunch it started to rain, and a rush was made to get our machines under cover. It also delayed us, for it fairly smoked down, but at 2pm we started. I had no cape, but before long it ceased, and five of us ‘got away’ from the rest. The ‘two miles of villages’ were soon left behind, and for many miles no one spoke, each pedalling hard yet steadily. We entered the Trent valley at Weston, and with the wind behind, the long level stretches were dead easy. Yet we did find the time to look about us, and note the fine old houses and wonderful valley scenery. Near Stone, we eased off a little – that is all except Tom and the Hindley chap, both of whom, one behind the other, flew out of sight riding like the dickens. Before long the main body came up, and so we tucked behind, only slacking in the awkward streets of Stone, where Tom and his erstwhile partner had stopped for a drink. At the sight of us, they gulped down their ‘Vimto’s’ or whatever it was, and hurried after us. Now the only sound was the humming of tyres on the hard road. Near Newcastle, a misfortune happened. A cyclist was riding easily before us, and we swung out to pass him, but the lady rider behind me did not see him, and was unprepared when I swerved. The result was that her front wheel collided with my rear one, and she was thrown heavily. She was not hurt, however, though a pedal was damaged and her rear wheel buckled. The pedal was easily put right, and by disconnecting the back calliper brake, we got the wheel to rotate without catching. We now retired across the road for a milk and soda. Again, the five of us got together, crashing through the rough streets of Newcastle and on the poor squalid road beyond. We were bumped and jolted unmercifully, and the long, gradual inclines proved somewhat trying. We walked two of them, the one to Talke being especially hard. Now there were only four of us, one having eased off, but on the aforementioned incline, three passed us and two joined us. Then we flew down to Red Bull, where the two Hindley chaps broke away for Holmes Chapel. One of our party started to lag, so I kept with him, and Tom went on with another. In Congleton we found them having hot drinks, so I joined them. Whilst we were here, the rest of the club passed. The drinks were hot. We could not get them down, and had to hold the tumbler with a handkerchief. We made a start by walking up that dangerous hill on the Alderley road, and then – we let it go. By mutual consent, it became each man for himself. I got in front, and felt in glorious form all at once, the devil seeming to take possession of the three of us. We hurtled downhill, uphill, on the level, overtaking every cyclist we saw, even motorcars were left behind – and the road was crowded. I got in Alderley just behind the first party, half an hour after leaving Congleton, over 9 miles away, at 6pm. Came a wash, then much needed tea, for we had covered 45 miles since lunch. One of our party was dozing, and became the subject of much fun. The ‘pottering’ section – that is the day club run, had all but one gone, and that one was a girl, who attended to our wants like a little brick. During tea it started to rain, and soon settled down to persistent, heavy drizzle. In a spirit of optimism, I had discarded my cape before starting, and now I felt the loss of it. Moreover, I had no extension on my front mudguard, and the slush from the road came all over me. I was one of the last to leave, and pushed on hard to catch another, reaching him in Wilmslow, and the two of us made an effort to catch the main party, which we did at Handforth. I do not know what became of Tom, he seemed to disappear at Alderley Cross. At Didsbury, I got in front with the girl cyclist, and both of us drew away from the rest. The going was exceptionally easy, although by now, I was in a thoroughly soaked condition, but I did not mind so long as my cigarettes were dry! The interesting company (my companion was bubbling over with good humour and energy) seemed to shorten the road amazingly, and Chorlton and Stretford were soon set behind. From Barton, it was all climbing to Walkden, then we took Salford road to Four Lane ends. We parted company at Daubhill station, and in two or three minutes I reached home. Home at 9pm. Ten hours since, we were 103 miles away, in a crowded village between Birmingham and Coventry, among cyclists from all parts of Britain. The thought itself is an inspiration, an idea of what mileage the little bicycle can do, the limitless possibilities of a cyclist who is fit enough for it. Yes, during the past 27 hours, whilst the folks at home were asleep, or doing nothing, penned up between bricks and mortar, my bicycle and I had covered 206 miles of road, seen the wonderful little villages, those old-world towns, a great medieval cathedral, a beautiful vale, and had ridden right across two counties, having been in four. It speaks for itself.